Dean Revell puts the case for mixed pasture swards at Lambex 2018. STOCK prefer to eat a smorgasbord of feed types rather than a single species, and the ability to provide diversity in diet will make animals perform better. 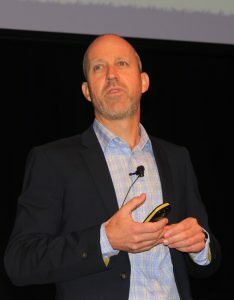 Producers who attended LambEx 2018 in Perth recently were encouraged to think about a diverse diet for their sheep by contract researcher Dean Revell from Revell Science in Perth. “Managing for diet in a livestock production system can achieve multiple benefits,” Mr Revell said. Mr Revell said one of the benefits of a mixed sward was that it could make better use of rainfall when it fell, regardless of the time of year. “In some years, the so-called out-of-season rainfall can amount to a significant portion of annual rainfall, and the phenomenon is expected to increase with changing climate patterns,” he said. “By using a combination of plants, we can go a long way to removing the concept of out-of-season from our production systems, because some plants in a diverse system will be more capable than others of coping with a particular set of environmental conditions. It was also important to look to natural systems and get a cue for how this could work in grazing operations. Identifying species with key functional roles to mimic the more complex native systems and then planting them in a stand to give the pasture mix resilience was important. But it was not a one-size fits all formula for that mix. “We do not need to search for the ideal mixture for all situations, but rather we should be open to using a range of species that could have quite broad or quite local relevance,” Mr Revell said. There is also no magic number for the number of species in a mixed sward and even small levels of different plants can add to the productivity of an animal. “The proportion of a plant in an animal’s diet is not necessarily proportional to the benefits it gets from consuming it,” Mr Revell said. And mixed pasture swards delivered results. Mr Revell said research showed clear production responses to plant diversity with a mixed pasture showing a greater overall biomass. “As plant species richness increased from a monoculture to a system with 10 species, dry biomass production also increased by nearly 50 per cent compared to monocultures,” he said. Put simply, the sheep eat more because the diet is more varied. “Sheep have a higher intake because they have the capacity to eat more,” Mr Revell said. Stock which graze these systems can do so selectively, but Mr Revell said this could be managed by high stocking rates, and moving stock from one paddock or cell area to another. “Ideally, the moves need to occur before the most preferred plants have been consumed,” he said. The end result is stock that eat a more diverse diet, and more of it, but it is a system that needs to be managed. “Diet diversity is a practical and effective tool to stimulate intake,” he said.